In other news: the lack of agreement on NAFTA may have an upside; BC’s contractor sustainability review is expected to make a difference; an Oregon teenager who started a wildfire could owe more than he will earn in a lifetime; and allergy sufferers should watch this video. In celebration of Queen Victoria’s B-day, the frogs will be off on Monday. This is a bad time of year in Central Indiana for those with seasonal allergies and asthma. But this week, it might get worse thanks to “thunder fever.” “The high pressure coming in before a thunderstorm makes fungal spores swell, bust open,” said Dr. Carol Fosso, an allergy specialist and past-president of the Indiana Allergy and Immunology Society. …Scientific studies in the U.S., Canada and Britain have found a link between Alternaria mold, thunderstorms and an increase in severe and sometimes fatal asthma attacks. As part of the proposed agreement and subject to available funding, Active Energy will build an initial 25 tonnes per hour CoalSwitch plant at the PowerWood site to produce the company’s unique biomass fuel pellet. Active Energy Group PLC is to acquire a controlling interest in PowerWood Canada Corp, a privately owned Canadian forestry company. PowerWood holds substantial forestry assets in Alberta, Canada, under forestry management agreements, and deciduous cutting rights issued by the Crown Province of Alberta. Active Energy Group (AEG) said in a statement that the proposed acquisition would secure feedstock and support the proposed roll-out of CoalSwitch in the province of Alberta. PowerWood has access to 300,000 tonnes of merchantable timber (not including biomass or residues from forestry operations) annually from a total forestry area of circa five million hectares in mature, established, natural forestry in Northern Alberta. 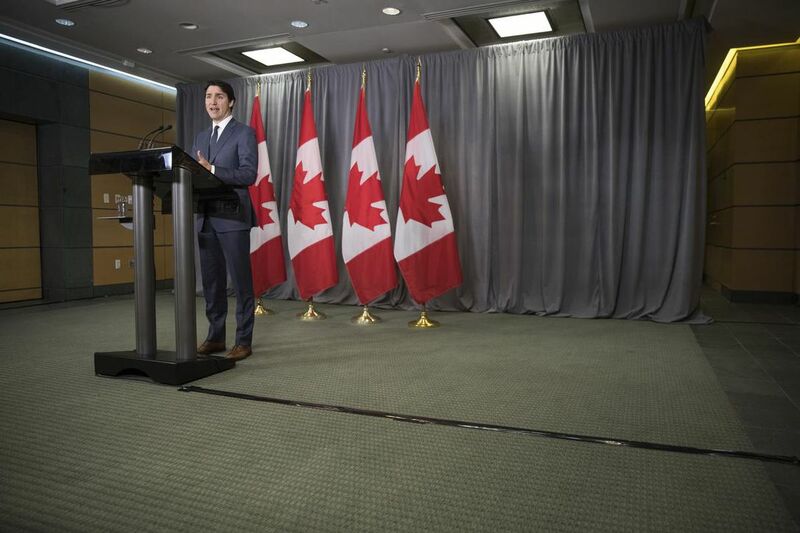 The impasse in the North American Free Trade Agreement talks is commonly viewed as a setback for Canada. It is not. The fact that no agreement may be reached until after the U.S. Congressional midterm elections in November gives Canadians — and Canadian political parties — a chance to hold the debate we have never had: Do we want to continue within the broad parameters of deal that firmly binds the economies of Canada, the U.S. and Mexico? Or do we want something fundamentally different? Up to now, Justin Trudeau’s Liberal government has successfully presented the NAFTA renegotiation as a non-partisan national emergency. …But the hiatus caused by the U.S. mid-terms gives Canadians a chance to debate the content of NAFTA. …Do we want to rely on a deal that has proven itself unable to resist unwarranted U.S. trade sanctions against aluminum, steel and softwood lumber? David Elstone, Executive Director of the Truck Loggers Association issued the following statement regarding the resulting recommendations from the Contractor’s Sustainability Review announced today by Minister Donaldson, Ministry of Forests, Lands, Natural Resource Operations & Rural Developments: “We feel confident the long-awaited Contractor Sustainability Review has captured the concerns of independent timber harvesting contractors across the Province. It validates there are problems in the relationships between contractors and licensees and confirms the declining profitability of contractors. “The resulting 13 recommendations addressed the majority of the issues that the TLA has been raising for years with government. They will make a meaningful and positive difference for loggers, communities, and the industry. “We expect that when these recommendations are implemented, they will improve contractors’ ability to negotiate contracts that we expect will ensure their businesses earn a fair rate of return. Recommendations from the Logging Contractor Sustainability Review will help improve relationships between logging contractors and forest licensees, Doug Donaldson, Minister of Forests, Lands, Natural Resource Operations and Rural Development, has announced. “The report by George Abbott and Circle Square Solutions, and their 13 proposals, provide a good basis for the next round of facilitation,” said Donaldson. The intent of the review process is to improve the overall competitiveness of both logging contractors and licensees. Common themes that emerged from the report were the need for better data and better communications. The report makes 13 recommendations that range from making better use of technology, improving communications, better information-sharing, to ensuring best practices for setting contractors rates of pay and dispute-resolution mechanisms. The rising cost of newsprint used by the Trib probably has several causes. One is that various environmental groups have made it more expensive for wood-pulp processors in North America to harvest the trees used to manufacture newsprint. Another may be related to the problems discussed in the article titled “Recycling, Once Embraced by Business and Environmentalists, Now Under Siege” in the Wall Street Journal. To summarize its reporting, it seems recycling is no longer profitable in most cases except for cans and cardboard. This has affected the availability of raw materials used to manufacture newsprint, which typically contains some recycled paper. According to the article, “As cities aggressively expanded recycling programs to keep more discarded household items out of landfills, the purity of U.S. scrap deteriorated as more trash infiltrated the recyclables. From a distance, the Radius at Royal Oak looks like countless other residential complexes currently under construction in the Greater Victoria region. But as the six-storey building approaches completion in March 2019, it promises to redefine both the engineering and economics of residential construction. “This is a special building, for sure,” said Travis Lee of Tri-Eagle Plaza… The development is special in so far that it is wood-framed. The provincial government in 2009 changed the building code to permit wood-framed buildings of up to six storeys – up from four. According to Lee, it is one of two six-storey wood-framed rental buildings in Saanich, with the other near Tillicum Centre. “Building a six-storey wood frame is becoming the new normal,” said Lee. A planned ordinance which will mandate the retrofitting by property owners of as many as 500 “soft-story” multi-family wood buildings throughout the City can’t begin soon enough for Mayor Terry Tornek’s liking. “The ordinance needs to be done in less than a year,” said Tornek. …According to current City estimates, there are approximately 493 wood soft-story buildings constructed in Pasadena before the 1978 building code became effective, that require evaluation and possible retrofit… and are wood-frame buildings with more than one story, which typically have extensive ground story windows, garage doors, or open-air spaces, with little or no enclosing solid wall. The buildings result in a relatively soft or weak lateral load resisting system in the lower story making them more vulnerable to collapse during an earthquake. Since 1967, first-year Yale architecture students have designed and built buildings to better the community — and last year’s project was a stellar showing in affordable housing. For the 2017 Jim Vlock First Year Building Project, students completed a 1,000-square-foot home that explores cost-efficient and flexible design. 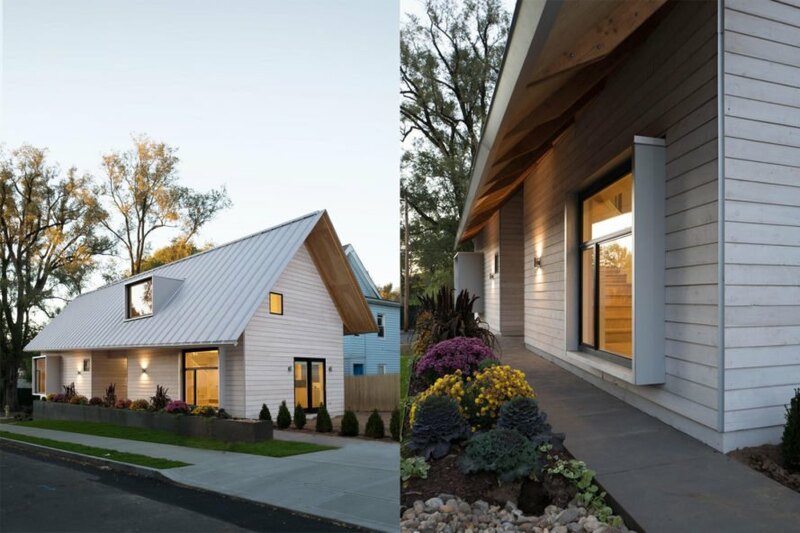 …The house for the homeless is a handsome prefabricated structure clad in cedar and topped with a standing-seam metal gable roof. According to the project statement, students were “challenged to develop a cost-efficient, flexible design that tackles replicability in material, means, and method of construction.” …For the 2018 Jim Vlock First Year Building Project, the Yale School of Architecture will partner with SmartLam, the first manufacturer of cross-laminated timber in the U.S., which will provide CLT panels for the construction of a two-family home for the homeless. Near where I live is a tall, narrow house. Somewhat to the quirky side of pretty, with snow-white walls, cute bulging eye-windows, visible roof-gardens and stupendous ocean views it suggests some skinny mariner staring out to sea. But I wouldn’t live there for quids. Why? Because it’s concrete. …Timber buildings have a warmth, a softness. They move and creak, they sigh. They seem capable, at least, of loving you back. …Concrete is architecture’s snow queen, startlingly photogenic but ruthless, inflexible and ultimately conscienceless. …Yet it’s so on-trend. Concrete is the new black. We used to deride the concrete box. Now it seems we all want to live in one. …the revival of mid-century brutalism …The feel is emaciated. Comfortless. Gaunt. …cement being the third-highest producer of anthropogenic CO2 – is ecologically abysmal …Plus there’s an alternative. CLT is cross-laminated timber. VANCOUVER – Canada is a global leader in protecting its conserved land from human destruction, but its parks are in danger of being “loved to death” by thousands of people trekking through the backcountry, says a co-author of a study that details the degradation of one-third of the world’s protected areas. Oscar Venter, associate professor of forestry at UNBC, said Banff and Jasper are examples… Economic pursuits, such as forestry, mining and oil and gas, are also part of the problem, Venter said. …Venter is part of an international team of researchers… whose work was published Thursday in the journal Science. It looked at 50,000 protected areas worldwide and found one-third of the area is under intense pressure from activities like road building, logging and urbanization. The B.C. government spent a record $195 million last year on aviation companies, including airplanes and helicopters, to fight the massive wildfires that ravaged the province. The money represents about one-third of the total $568 million spent responding to the worst wildfire season in B.C. history. Freedom-of-information documents obtained by Postmedia show that Conair Group Inc. of Abbotsford easily received the highest payments, at $25.4 million. …According to the documents, the province paid a total of just over $195 million to scores of aviation companies for contracted flights to fight the wildfires. …In comparison, the province paid an estimated $135 million to aviation companies in 2009 and an estimated $118 million in 2003. Last week, the Ministry of Forests, Lands, Natural Resource Operations and Rural Development (FLNRORD) released its commissioned report, Addressing the New Normal: 21st Century Disaster Management in British Columbia, which makes 108 recommendations for both prevention and dealing with flooding or wildfires. “Their 108 recommendations will take some time to fully consider. There are some recommendations that are being acted on already. For example, as part of Budget 2018, we’re committing $50 million over three years to wildfire prevention and wildfire risk reduction around communities,” said Doug Donaldson, Minister of FLNRORD. Cariboo North MLA Coralee Oakes says she is pleased that those affected had a chance to engage with government on the report, but is concerned about funding. The Board investigated a complaint about proposed harvesting around recreation sites at Thone and Williamson Lakes. The complainants were concerned that the cutblocks were too close to the campsites and lakes. 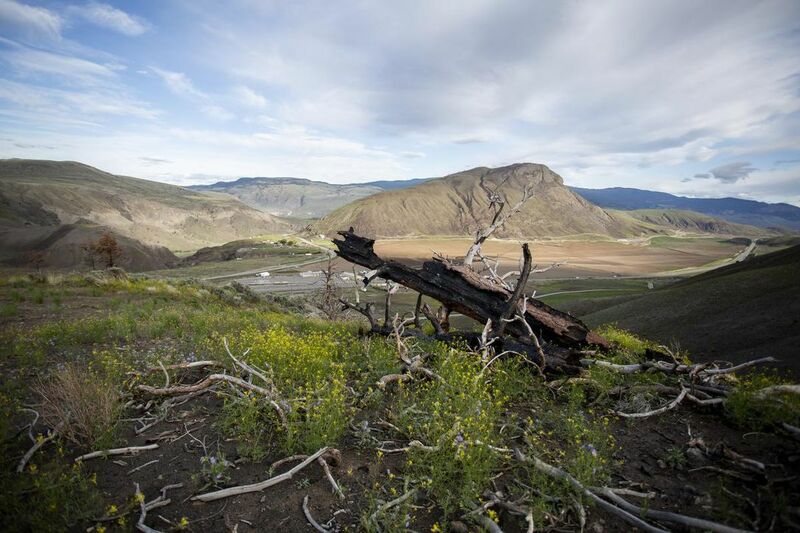 They thought the harvesting posed and unacceptable risk to: the recreational experience of campers and anglers, public safety due windthrow, riparian ecosystems and water levels of the lakes and streams. Harvesting in recreation sites had been authorized by a recreation officer. This investigation examined whether the planned harvest would comply with the legal requirements, whether the harvest adequately managed the risk to the elements the complainants were concerned about, if the recreation officer’s authorization of harvest was reasonable and if public consultation was appropriate. VICTORIA – An investigation of a complaint by the Valhalla Wilderness Society about forestry activities near Summit Lake has found that the Nakusp and Area Community Forest (NACFOR) and the Ministry of Forests, Lands and Natural Resource Operations and Rural Development (FLNRO) have taken reasonable steps to ensure forest practices protect the western toad population. “Both NACFOR and FLNRO contributed to research and expert advice was sought regarding toad habitat and population protection,” said Bruce Larson, board vice-chair. “Both were also involved in developing best management practices to guide forest practices, although there is no legal requirement to do so.” The Summit Lake toad population is recognized as regionally important, and the Province is considering protection for it under the Forest and Range Practices Act. The James Camerons and David Suzukis and Neil Youngs have done their work very well. Many outsiders now see this whole province as universally tainted and polluted — a charge that is absolutely false, even in the oilsands area. But now there’s an image-changer for David Suzuki to stick in his pipe. He could smoke it when he accepts that bizarre honorary doctorate from the University of Alberta. After a great deal of work, the province has put together what NDP Environment Minister Shannon Phillips proudly and correctly calls “the largest contiguous area of protected boreal forest on the planet.” It covers 67,000 square kilometres. …And so, here’s some advice for the next anti-oilsand advocate who is determined to snap the ugliest possible aerial shots of industrial activity: Keep going. Fly north. Pretty much all you’ll see is vast unspoiled forest, a massive carbon sink for the whole planet, stretching up into the Northwest Territories. The long anticipated report on the BC Flood and Wildfires of 2017 submitted April 30, 2018 finally came out last week. An independent team co-chaired by Maureen Chapman and George Abbott produced a 148-page report along with a shorter executive summary. Not surprisingly the report was similar in many ways to the regional report by the CRD with the main difference being the coverage of the flooding concerns in addition to the wildfires. The recent report is framed around four interrelated themes: partnership and preparation, knowledge and tools, communication and awareness and investment. A total of 108 recommendations were discussed which included fourteen “strategic shifts” throughout the recommendations. For example the first section discussed the importance of working with indigenous governments and communities. Alberta has just created the largest protected area of boreal forest in the world by setting aside four new provincial parks and expanding another along its northeastern borders. … adds more than 13,600 square kilometres of protected land across much of northeastern Alberta. It makes for the largest addition ever to the province’s inventory of parkland. To be clear, these preserves won’t be much at all like the parks that many Albertans flock to for a weekend getaway of camping, hiking or fishing. Instead, these remote wildland parks will serve to protect much of Canada’s unique boreal forest ecosystem and threatened species such as the wood bison, woodland caribou and peregrine falcon by making the areas off-limits to logging, mining and other industries. The BC Supreme Court has ruled that the Sechelt Community Projects, the district-owned company that manages the Sunshine Coast Community Forest, and the Ministry of Forests, Lands and Natural Resource Operations carried out proper consultations before a cutting permit was issued for the block in the East Wilson Creek area. …Justice Iyer said the case hinged not on whether SCPI and FLNRO ought to have consulted the broader community but whether there was a legal obligation to do so. She found there is no legal obligation beyond the one to “consult with Aboriginal groups that may have an Aboriginal right or interest in the land under consideration,” and that those consultations took place. Iyer noted that SCPI is required to “inform the public about its intended activities,” but that requirement should not be interpreted as a duty to consult. The forest surrounding Argenta has been Carolyn Schramm’s home for nearly 50 years. …But logging plans for what is locally known as the Argenta Johnsons Landing face, a roughly 10-kilometre stretch of unprotected land on a slope underneath Mount Willet that meets Kootenay Lake, could soon be putting the proverbial parking lot in Schramm’s paradise. Cooper Creek Cedar, which owns two timber licences for the area, is currently assessing the stability of the slope with plans to have potential cut blocks and road routes identified by August. …Schramm is part of a local group fighting those plans. Mount Willet Wilderness Forever wants the land included in the Purcell Wilderness Conservancy. Resource revenue sharing is on the minds of Ontario’s three provincial leadership hopefuls as they roll through Northern Ontario during the election. Allowing First Nations to benefit from mining and forestry operations on their traditional land has been a contentious and unresolved issue for many years. The Wynne Liberal government revealed a potential landmark deal – pending their re-election – by announcing that agreements had been signed with three First Nations organizations, representing 32 communities across the North. …Wendy Landry, president of the Northwestern Ontario Municipal Association (NOMA) applauded the signatory communities, calling it a “long time coming.” …But she said the province’s largesse needs to be spread around to all communities, some of which are struggling to maintain infrastructure. Two fires with two very different outcomes illustrate the critical need for thinning and prescribed burns. 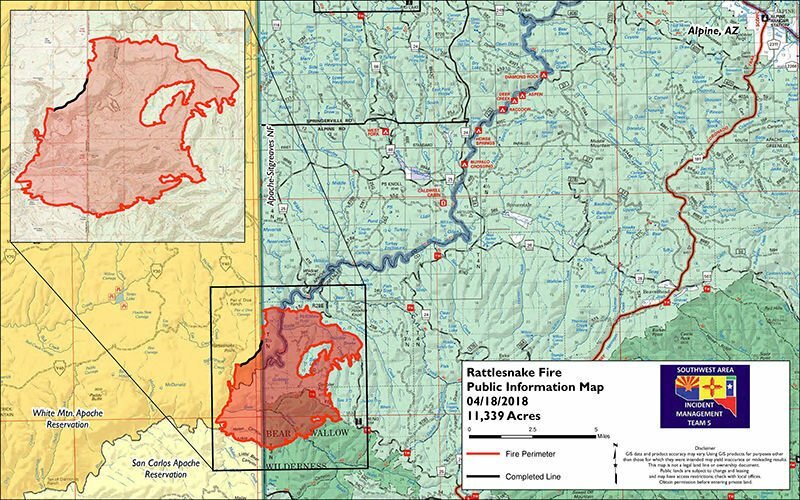 On April 11, the Rattlesnake Fire broke out on the Apache-Sitgreaves National Forests and Fort Apache Indian Reservation. On April 27, the Tinder Fire broke out on the Coconino National Forest near the C.C. Cragin Reservoir. The Rattlesnake burned for three weeks, but gave crews the time to create control lines to get a handle on the fire. The Tinder Fire, in comparison, burned more than 50 homes and buildings, shut down a highway and raged so intensely air and ground support could do little to stave off the damage. The difference? 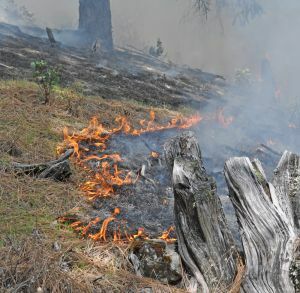 The Rattlesnake advanced into a previously completed prescribed burn, while the Tinder raced through a forest choked with ladder fuels and dense tree growth. Controlled burns for community safety and forest health were conducted in the Ashland Watershed on May 14 and 15. In the evening, smoke from the burns settled into town. …The next day the city received some negative reactions via email and social media. This report explains what happened and why, discusses some implications and describes resources the public can use to deal with such situations as well as prolonged smoke incidents of the kind that occurred last summer. …Two controlled burns took place. Both were under the supervision of experienced burn bosses and both complied with all official specifications for controlled burning. Both were conducted with permission and guidance from Oregon Department of Forestry meteorologists whose job it is to regulate controlled burning throughout the state. …The bottom line is that maintaining low fuels levels requires controlled burning and occasionally, despite following all the best practices, some smoke will come into town. MARYSVILLE, Calif. – A healthier, thinner forest reduces fire risk significantly, and it also protects water quality and can improve water quantity. The Yuba watershed is about to reap all of those benefits, through a pilot project of the Forest Resilience Bond with Blue Forest Conservation and the World Resources Institute. The Yuba County Water agency will support this effort with a $1.5 million cost-share contribution to help fund the planned restoration in the Yuba Project. The agency’s board of directors today approved the cost-share contribution, which will help fund various forest management techniques and allow researchers to study the effects on the watershed. The pilot project protects 15,000 acres within the north Yuba watershed. The total restoration cost for the project is expected to be about $4.6 million. HOOD RIVER, Ore. — A teenager who started a huge wildfire in the scenic Columbia River Gorge in Oregon could owe more in restitution that he will earn in a lifetime. Eleven requests for restitution totaling almost $37 million have been submitted to a court. That covers the costs of firefighting, repair and restoration to the gorge and damage to homes. At a hearing Thursday, the lawyer for the 15-year-old defendant urged Hood River County Judge John Olson to impose a “reasonable and rational” amount of restitution. The attorney, Jack Morris, said ordering a boy who is indigent to pay $37 million is “absurd.” …The teen said he threw one firework that exploded in the air along a trail and a second one that had a longer fuse and ignited brush when it hit the ground. …Beyond the temporary inconveniences, the fire blackened the crown jewel of an outdoors-loving region for years to come. One third of the world’s protected lands are being degraded by human activities and are not fit for purpose, according to a new study. 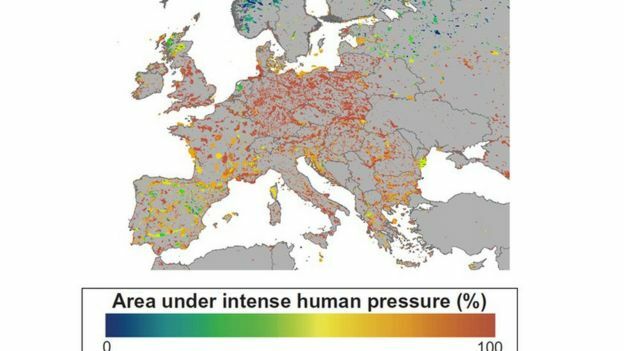 Six million sq km of forests, parks and conservation areas are under “intense human pressure” from mining, logging and farming. Countries rich and poor, are quick to designate protected areas but fail to follow up with funding and enforcement. This is why biodiversity is still in catastrophic decline, the authors say. …Since the Convention on Biological Diversity was ratified in 1992, the areas under protection have doubled in size and now amount to almost 15% of the lands and 8% of the oceans. But researchers now say that many of these protected areas are in reality “paper parks”, where activities, such as building roads, installing power lines, even building cities, continue without restrictions. The boreal forest …stores 40 percent of the planet’s terrestrial carbon. North America’s boreal forest …covers an astounding 1.5 billion acres—more than 2.3 million square miles. 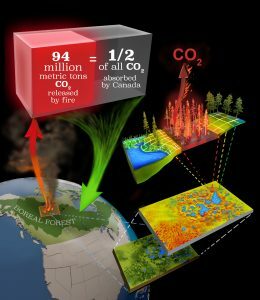 As mega-fires in the boreal forest become more frequent and more intense, scientists believe the burning of these carbon-rich areas will drastically increase the amount of carbon being released into the atmosphere. But because these mega-fire areas are so large—more than 10,000 hectares (25,000 acres)—and are home to a complex diversity of vegetation types, accurately predicting these emissions has been challenging. A recent study completed by a team of Northern Arizona University scientists and published in Global Change Biology was designed to help solve this problem. …“The paper is unique in that it combines detailed, on-the-ground fieldwork with satellite remote sensing products,” Michelle Mack said. WINDSOR, NS – Investing in mitigation and adaptation infrastructure projects to strengthen communities against the effects of climate change is critical to protecting the lives and livelihoods of Canadians, promoting economic growth and strengthening the middle class. Today, the Honourable Scott Brison, President of the Treasury Board and Member of Parliament for Kings–Hants, helped launch the Disaster Mitigation and Adaptation Fund (DMAF), a 10-year national program that will invest $2 billion in projects that help communities better withstand natural hazards such as floods, wildfires, seismic events and droughts. This follows the official launch earlier today in Calgary by the Honourable Amarjeet Sohi, Minister of Infrastructure and Communities. DMAF will support large-scale infrastructure projects with a minimum cost of $20 million like diversion channels, wetland restorations, wildfire barriers and setback levees. 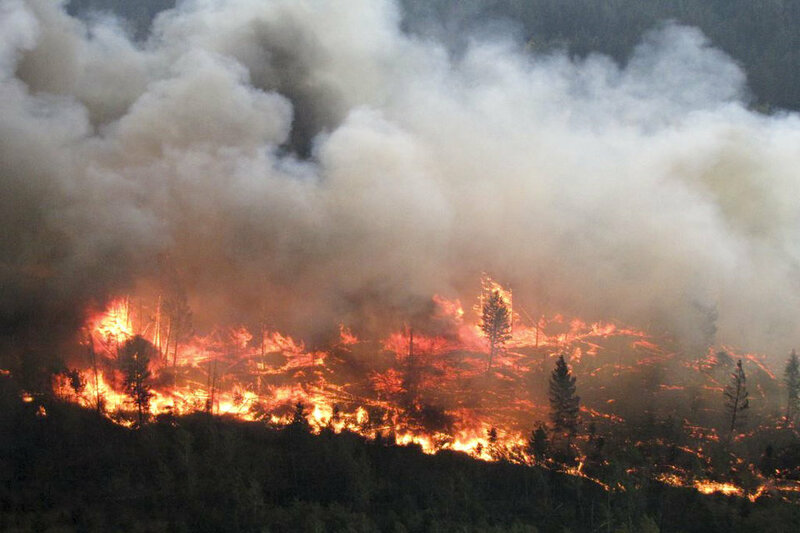 A top climate change mitigation strategy favoured by British Columbians is the restoration of forests ravaged by wildfires and insects, according to an assessment of public attitudes toward forest carbon mitigation. Researchers with the Pacific Institute for Climate Solutions (PICS) Forest Carbon Management Project analyzed public opinion about forest management strategies designed to mitigate climate change, as well as the factors that influence an individual’s support for a particular option. Rehabilitation strategy garnered the highest support of eight strategies, according to the research published in the open-access science journal PLOS ONE. …Peterson St-Laurent and co-authors Shannon Hagerman, Robert Kozak and George Hoberg also concluded that the public has greater trust in scientists and professional foresters than government and industry. Government can address the distrust by enhancing partnerships with trusted actors such as environmental organizations, First Nations and scientists, they noted. But it’s not just about climate, he added. More Canadian cities will experience damage from the emerald ash borer than previously thought. As a result of climate change and fewer days of extreme cold, the beetle may eat its way further north than originally estimated. Kim Cuddington, a professor of biology at the University of Waterloo, led the team that produced a probability map for North America showing where the emerald ash borer is likely to kill trees. “We ran specific predictions to help Canadian cities decide if they need to make plans before they’re affected,” said Cuddington. “Calgary is likely to experience damage, as are Thunder Bay, Prince George and Winnipeg. Edmonton and Saskatoon are less likely, but they should remain vigilant.” So far, the wood-boring beetle has wiped out tens of millions of ash trees and will likely cost municipalities $2 billion. Still, everyone expected the species’ rapid migration would be stopped by Canada’s extremely cold temperatures.